The Zeiss headgear currently works with the iPhone 6 and Galaxy S5. No bones about it: The Samsung Gear VR is an incredibly cool piece of hardware. But its biggest problem is in the name -- it's a Samsung product designed for one Samsung smartphone. That's a big hurdle to overcome, even if Oculus is behind the headset's secret sauce. But the Gear VR is not the only mobile VR solution on the block, it seems, because Zeiss has just announced a VR headset of its own. 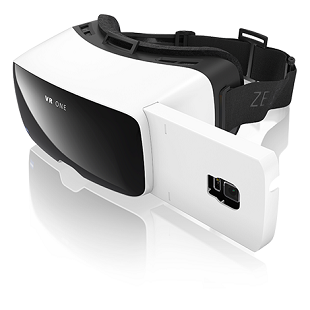 The Zeiss VR One is now available for pre-order for $99, which puts the kit at roughly half the Gear VR's rumored pricetag of $199.99 (not including the Galaxy Note 4). With an expected ship window of "before Christmas 2014," it's also (presumably) landing with buyers in the same time frame as the Gear VR. Along with supporting multiple mobile devices (more on that in a moment), the VR One also has a "see-through" front shield, meaning your smartphone's rear camera will act as a window to the outside world -- great news for augmented reality buffs. There are openings to access your phone's audio and charging connectors when the VR One is in use, and eyeglasses can be worn under the unit. If you pre-order a VR One, you can order the headgear with one of two smartphone trays, as it plays nice with the Apple iPhone 6 (not the 6 Plus), and the Samsung Galaxy S5. You pop your phone into the tray, slide the tray into the VR One, and you're ready to trip the lights fantastic with the Harmonix Music Visualizer. While only two devices are currently supported, other smartphones will get trays in the coming months as well, so long as their screen size is at least 4.7 inches, while not exceeding 5.2 inches (sorry, no phablets allowed). If you're a power user with iOS AND Android devices, additional phone trays can be purchased for $9.99. But now, the downside: software. The hardware in the VR One kit is ready to go, but there's no solidified software ecosystem. Samsung Gear VR locks you into one phone for one head unit, but buying such a product means you'll have software to use right out of the box. With the VR One, you will be utterly dependent on indie software devs to create VR-capable games and apps. That isn't a bad scenario, most of the time, but expect a slow software rollout, for sure. On the other hand, the VR One SDK uses Unity3D, so developing software should be a (relative) breeze.